Start off your visit on the 11th (Sat): admire all the interesting features of Norbulingka Institute. On the 12th (Sun), you'll have a packed day of sightseeing: contemplate in the serene atmosphere at Dalai Lama Temple Complex, get engrossed in the history at Tibetan Museum, and then take your sightseeing to a higher altitude at Triund Hill. To find maps, traveler tips, ratings, and other tourist information, use the Dharamsala trip site . Mumbai to Dharamsala is an approximately 6.5-hour flight. You can also drive; or do a combination of train and taxi. Cap off your sightseeing on the 13th (Mon) early enough to go by car to Dalhousie. Kick off your visit on the 14th (Tue): take in the awesome beauty at Dainkund Peak, browse the different shops at Gandhi Chowk Shopping Plaza, then pause for some serene contemplation at St. John's Church, and finally steep yourself in history at Subhash Baoli. For traveler tips, photos, ratings, and more tourist information, read Dalhousie online trip maker . Drive from Dharamsala to Dalhousie in 2.5 hours. Finish your sightseeing early on the 14th (Tue) to allow enough time to drive to Amritsar. Tarn Taran Sahib has been added to your itinerary. Popular historic sites such as Durgiana Temple and Gobindgarh Fort are in your itinerary. Museum-lovers will get to explore The Partition Museum and Virasat-e-Khlasa. 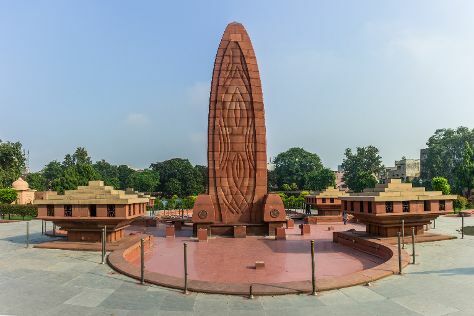 Next up on the itinerary: learn about all things military at Punjab State War Heroes Memorial & Museum, contemplate in the serene atmosphere at Digamber Jain Temple, get engrossed in the history at Maharaja Ranjit Singh Museum, and stop by India House. To see photos, more things to do, other places to visit, and more tourist information, read our Amritsar itinerary planner . Traveling by car from Dalhousie to Amritsar takes 3.5 hours. Alternatively, you can do a combination of bus and train; or do a combination of taxi and train. In May, daytime highs in Amritsar are 46°C, while nighttime lows are 26°C. Finish up your sightseeing early on the 17th (Fri) so you can travel back home.